When it comes to meal time Niko has his ups and downs. Sometimes he gobbles everything up, and sometimes he whines through dinner or breakfast or lunch. Sometimes he’s pretty clean at the end, and sometimes it looks like he lost the world’s biggest food fight. On days like those, the days where food is everywhere, I do what I can to lessen the mess by scraping the spoon up his face, in an effort to remove the cereal or whatever the mush of the hour may be. And truth be told, this spoonful of face goo usually ends up back in his mouth. It’s a lovely bout of recycling, really. Note: To the right of this post you can see Aunt Carolyn and Little N sitting on the grass, which as it turns out was Niko’s first time ever sitting on bare grass. And as far as we could tell he didn’t even swallow any bugs! Although, given some time I am sure anything could have been possible. 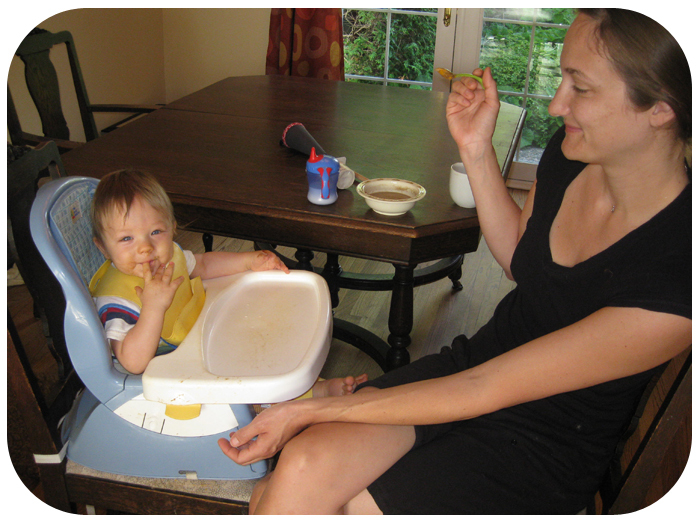 Niko: Look Mum, I can feed myself. Mum: Yes Niko, and look how well you hold your spoon. Well we did it! 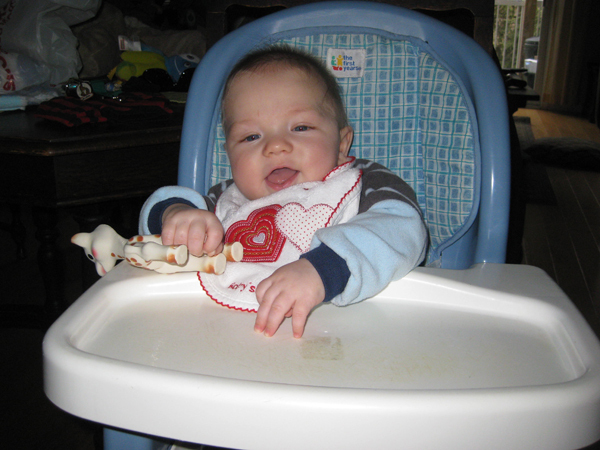 Rice cereal went down the hatch on March 1st: Niko’s five and a half month mark. 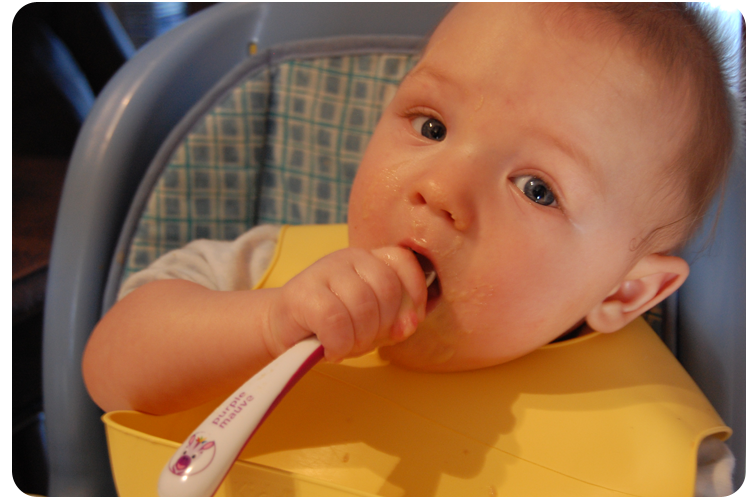 I had been thinking about it for a while, so following my own instincts and with the encouragement of a few other mommy friends, Niko got his first taste of solids yesterday. Solids though? Really? I am not so sure rice cereal can be classified as a solid seeing as what it really is, is a gooey mess! 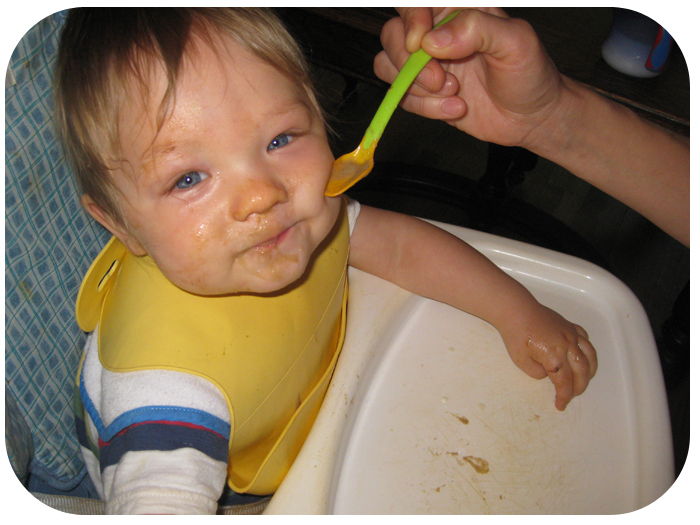 I am pretty sure half of Niko’s portion ended up on his bib, but he seemed to liked it. And how do I know he liked it? There were lots of tell tale signs. 1) I couldn’t seem to serve it up fast enough. If I took too long the ensuing, “ehh, ehh, ehh” could be heard coming from dis darling mouth. And with each “ehh” the pitch, insistence and impatience grew. 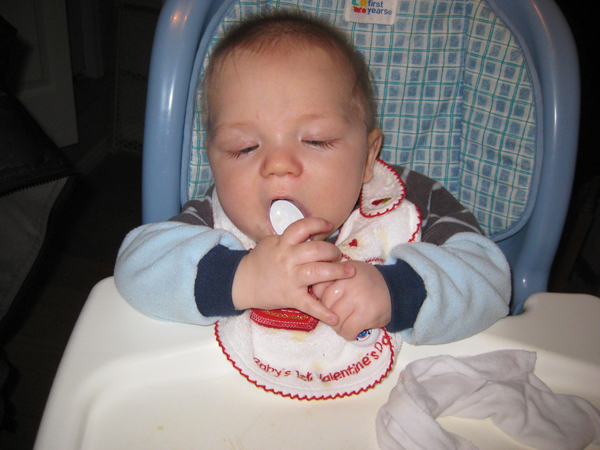 2) He gobbled up the whole serving (except for the part that clung to his bib), and even reached for the spoon to try to feed himself. So I guess our little guy is growing up. I think part of the reason I wanted to hold off on rice cereal was because I don’t want to rush him, and selfishly just want him to be “baby baby” for as long as possible. 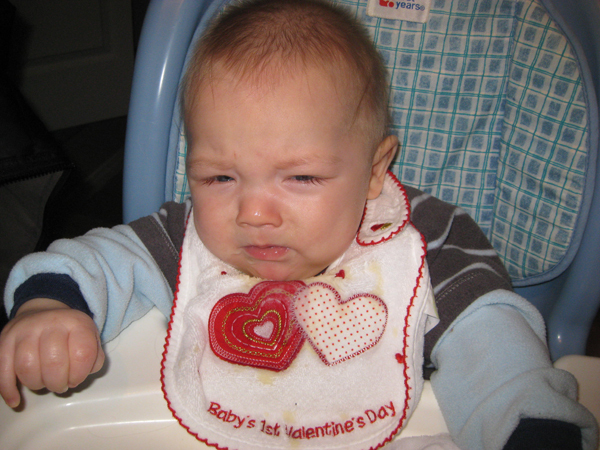 Secondly, the mess produced by solids: on his face, up his nose, on his chair, in his eyebrows, you name it, well that’s a mess I’m not really looking forward to seeing everyday! But seeing as the mess will be produced by “my little messer”, then I guess it’s not so bad.